The industry has been plagued by inferior, permanent, hard coat insulating products. HTI has been producing a solution that outperforms the competition on every level. Here are the most common myths that we hear. Permanent / hard coat insulation makes it difficult to service my engine. HTI’s insulation is applied so that your components remain modular. You can still service individual portions of your system. Also, HTI insulation does not break down and turn to dust like our competitor’s. You will be servicing your engine components less and less over time. Permanent / hard coat insulation is expensive. When you consider the longer life span of HTI’s military-grade insulation it actually costs less per year. Also, blanket-style insulation is typically removed during engine maintenance and not properly re-installed or completely left off the engine upon reassembly. Now think of the cost ramifications of zero insulation; both safety and performance. Permanent / hard coat insulation isn’t worth the time or effort to install. HTI works with your production and maintenance schedule to ensure that your components are ready and waiting to be installed. Permanent / hard coat insulation breaks down and allows combustible fluids to soak in rendering my engine extremely dangerous and flammable. My engine is to complicated and intricate for permanent / hard coat insulation. HTI works with your design team to develop an install that conforms to your exact specification. Our insulation adds only 1/8′ to the skin. HTI has implemented their insulation in some of the most “space demanding” areas. The image below is an example of one of the more complicated manifolds that HTI has produced. 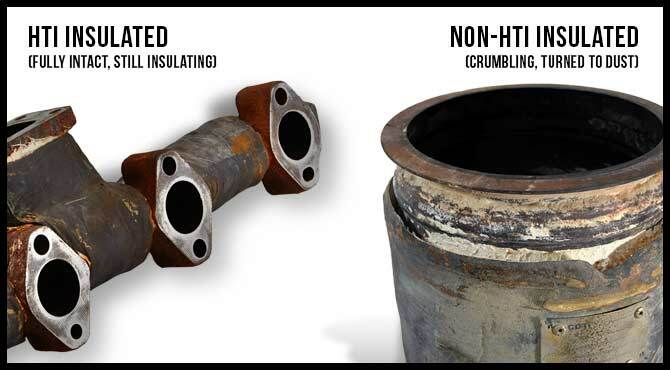 HTI has been producing a permanent, hard coat engine exhaust insulation solution for almost 3 decades. The proprietary technology was developed early on while producing insulation for military vehicles. Don’t let the common myths mentioned above steer you away from better performance, safety, and an improved bottom line. Contact HTI today to find out what HTI can do for you.